When I started my graduate level Composition and Rhetoric course a few months back, our professor began class by asking us, many of us practicing teachers, what the importance of theory was to teaching young writers. Again today, as I reflect on our final exam, I am called back to this question. What is so important about theory? I must confess that as that first class began, I wasn't convinced. I know theory. I had theory classes in undergrad. And I'm taking yet another class on literary theory at the moment. But what does theory matter when you are standing in front of a class of 28 students? Theory grounds our work with emerging writers. It forms our foundational understanding about what it means to be a writer, what it means to write. Theory informs our practice, and not the other way around. Theory is the framework which helps practictioners understand the bias, perspective, and underpinnings of why we do what we do. Theory informs our practice because when we begin to recognize the set of principles and systems that connect what we see happening in our writing, as teachers we are then able to use these theories to explain and predict what is happening. In terms of best practices, understanding historical theories of rhetoric and composition then also help teachers theorize themselves. By taking into account our perspectives, that is to say our philosophical and pedagogical views that guide our approaches to teaching rhetoric and composition, we are better able to engage with emerging writers when and how they need support. Theory informs our approach, our classroom writing activities, and the action happening every day in our writing classrooms. But when I first walked into the classroom over ten years ago, I did not have solid grasp on theories of rhetoric and composition. Over time, through the National Writing Project, I was introduced to the works of Donald Graves and Thomas Newkirk, Kelly Gallagher and Penny Kittle, Nancie Atwell and Lucy Calkins. These teachers and writers have identified theories of teaching composition in the secondary school setting, which for them has been informed by the larger tradition of composition and rhetorical studies. 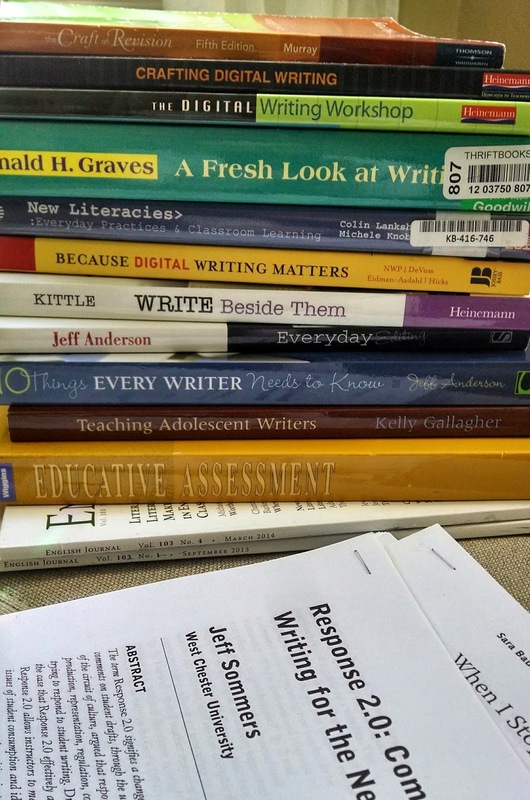 Their work helped me reflect and redefine what and how I was teaching young writers. However, having read the work of these teachers and composition theorists, I realize now that I still did not have a full grasp of their theoretical underpinnings. Now, after an intense semster studying process and post-process theories of composition, I more clearly see the implications of my lack of understanding of the significant role theory plays in the teaching of writing. This was highlighted for me in a simple activity we completed in class not all that long ago. Having completed a series of readings on assessment and grammar, our professor asked us to first theorize about what we believed and valued to be true about writing. Easy enough. I jotted down, "Writing is rewriting. Writers are constantly reshaping, reimagining, and reflecting on their work. And as such, we are always revising." Our next step, given our reading that week, was to apply our theory. 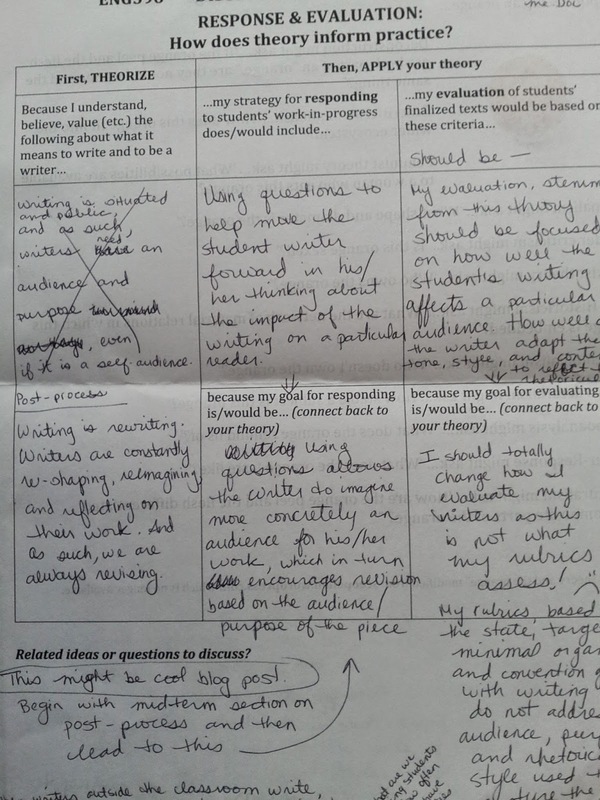 What was my strategy for responding to students' work in-progress? This was easy to answer, I though. "Using questins to help move the student writer forward in his/her thinking about the impact of the writing on a particular reader." So far, this activity was nothing too difficult. Then our professor asked us to begin connecting our feedback strategies and approaches back to our initial theorizing. How is my evaluation of students' finalized texts based on my initial criteria? Uh oh. Based on my theorizing and beliefs about the writing process, my evaluation of student writing should be focused on how well the students' writing affects a particular audience. How well did the writer adapt the tone, style, and content to reflect the rhetorical needs of a specific reader? But, wait. That's not what my rubrics evaluate. My rubrics, based on the state CCSS assessments for expositional writing, focus on organizational and convention goals and largely ignore audience, purpose, and rhetorial style. I began to understand how great the rift was between my espousal of of a process-based approach and the style in which I was actually proving feedback and assessing my student writers. In providing more feedback on their finalized papers, especially feedback that was focused on organizational strategies and conventions, I wasn't preparing my students to engage in the sorts of critical revision and reflection strategies that I thought I was. I wasn't asking my students to reflect on their rhetorical styles. Instead, my practice was actually undermining my theories of writing. So what is the importance of theory to a writing teacher? Everything!